simple machine, consisting of a sloping surface, whose purpose is to reduce the force that must be applied to raise a load. To raise a body vertically a force must be applied that is equal to the weight of the body, i.e. in physics and mechanics, transfer of energy by a force acting to displace a body. Work is equal to the product of the force and the distance through which it produces movement. ..... Click the link for more information. put into this machine is much greater than the amount done and the efficiency is small. On the other hand, the small effort necessary to turn the handle, when compared to the enormous load raised, makes such a device of great value. The screw is often used for making delicate adjustments of tools and machines, e.g., in the micrometer screw and in the carburetor of the gasoline engine (for regulating the flow of gasoline). 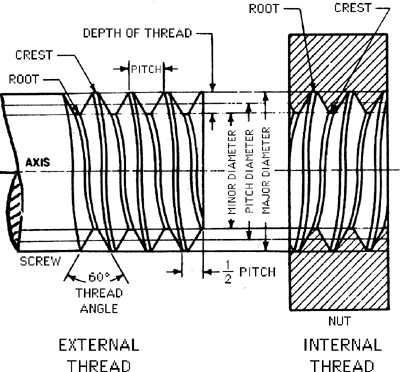 The self-tapping screw has notches in the first few threads that can cut female threads in a hollow cylinder. Wood and metal screws, the carpenter's and machinist's vise, the propeller of a boat or airplane, Archimedes' screw, and many other devices are applications of the screw. a machine part of cylindrical—sometimes conical—shape, with a helical surface; or a part with helical blades. Screws are grouped as follows: screws that interact directly with an external, or working, medium, and screws that interact with a threaded opening of another part. The first group includes screws used for the production of rotary motion from moving gases and liquids (for example, in a wind engine); for the production of a tractive force (for example, an airplane propeller or a screw propeller on a ship); and for moving gases, liquids, and viscous, friable, or lump materials, sometimes with the creation in them of pressure and agitation (for example, in fans, pumps, screw conveyors, screw presses, and stirring screw conveyors). The second group includes motion screws, heavy-duty (force) screws, micrometer screws, fastening screws, and set screws. A motion screw is the basic part of the screw mechanism in lathes and machines used for the rectilinear movement of assemblies and components (supports, tables, and so on) along a set of guides. Motion screws generally have a trapezoidal thread shape—less frequently square, triangular, or special—for screwing on nuts. A heavy-duty force screw is a main part of a screw mechanism designed to produce large axial stresses in presses, furnace pushers, jacks (load-lifting screws), and so on. Force screws generally have a trapezoidal or buttress thread, less frequently a square thread. Short force screws, such as those in jacks, work by compression; they are checked for strength and buckling during their design and manufacture. Long force screws work by tension and are tested for tensile strength. Micrometer screws have a precision thread with a small pitch; they are used in measuring machines, devices, and instruments (for example, in micrometers). A fastening screw is a basic part of a detachable screw joint; the body of the screw has a threaded shaft at one end and a head at the other end. Fastening screws for metals and other solid materials usually have a triangular cylindrical thread. Noncritical small-diameter (to 8 mm) fastening screws are also made as self-tapping screws, with a tapered portion of partially shaped thread on the point. This type of screw extrudes the thread (in soft metals) or cuts it (in plastics and hard metals) when screwed into a smooth hole. Wood screws, which are used for fastening wooden parts, have a tapered portion of the thread at the point. The screw head serves both as a clamp for the parts to be joined and as a grip for tightening the screw with a screwdriver, wrench, or other tool. Standard fastening screws with hexagonal, square, and other types of heads are widespread. Setscrews are generally used for the precise clamping of geodetic and other types of instruments, as well as for fastening screws in screw joints. Setscrews differ in the shape of the head and the clamping (adjusting) point. What does it mean when you dream about a screw? The dreamer may feel as if they are being turned like a screw in a situation where someone is taking advantage of them. A cylindrical body with a helical groove cut into its surface. A fastener with continuous ribs on a cylindrical or conical shank and a slotted, recessed, flat, or rounded head. Also known as screw fastener. (MIT) A lose, usually in software. Especially used for user-visible misbehaviour caused by a bug or misfeature. This use has become quite widespread outside MIT. When you're sure all the units are level and plumb, trim off any protruding shims and tighten the screws. If you watch the Lakers all year, there's that point where they have to tighten the screws and get ready for the playoffs,'' Sparks center Lisa Leslie said. If a torque wrench is available, tighten the screws to 75 lb-in. Just loosen the screws on the inside of the door, raise or lower the sweep, and then tighten the screws. Tighten the screws on the left side and then the right side. If any feel loose, tighten the screws that fasten the blade to the blade holder. What I expect to happen is the NFL will try to continue to tighten the screws on Southern California by extracting favorable terms from them, either through dictating the potential ownership group to creating an auction environment. They will tighten the screws without over-tightening of they could crack the case.